Embroidery has such a way of inspiring, with the beautiful artwork one can create and the beautiful threads and supplies one can collect. Today, we've got a bevy of products to show you, that all focus on this beautiful and timeless craft…..products that will let you create some beautiful artwork of your own, or even some custom storage for your embroidery floss collection, or that of a friend! Christmas is right around the corner, after all…. Create your own vintage thread cards with this beautiful set of images when combined with the Thread Cards die collection. You will love making these as special embellishments for your projects or even focal points. Use them to establish an elegant storage system for your very own embroidery floss collection. Hanging By a Thread will be available for purchase on November 15th. Hanging By a Thread contains a total of 9 images. The "A and G Blythe Boutique" card measures 1" x 1-3/8". "M.M. Crawley" card measures 1" x 1-3/4". The solid frame image measures 1-1/2" x 1-1/2". "Fine Thread" text block measures 1-1/4" x 3/16". This is the twenty-second in a monthly series that includes mega-sized versions of some of our favorite sentiments that were included in previously released sets. This twenty-second edition stems from the popular Little Labels set. The extra-large format will provide you with all new capabilities and design options. And for only $5, how can you go wrong? Think Big Favorites #22 will be available for purchase on November 15th. Think Big Favorites #22 contains a total of 3 images. "Just a Note" measures 2-3/8" x 3/4". 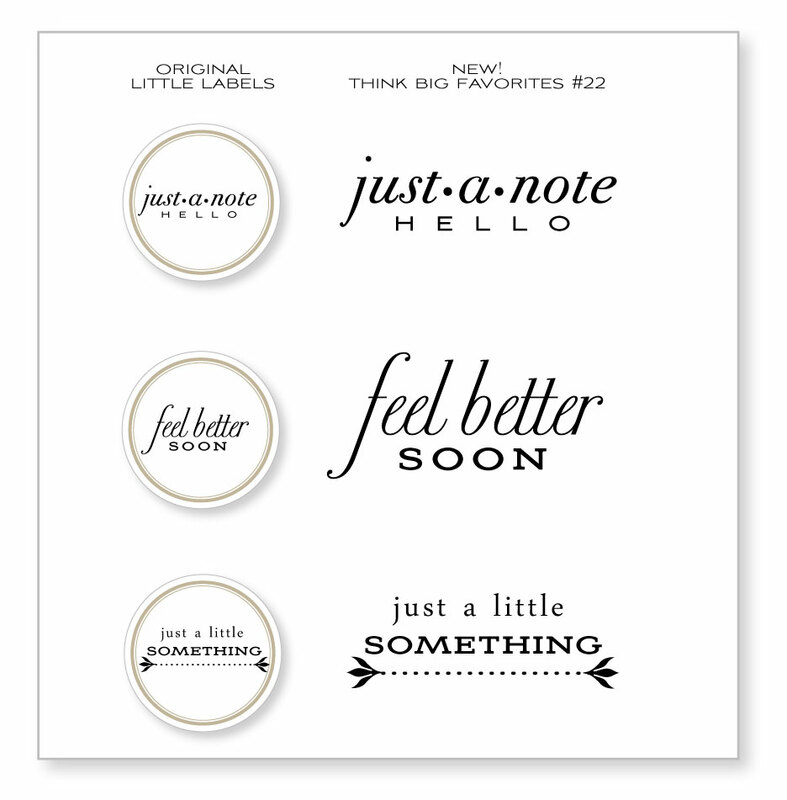 "Feel Better Soon" measures 2-1/4" x 1-1/8". "Just a Little Something" measures 2-1/4" x 3/4". Melissa Bickford has been busy and has another amazing set to bring you this month! This button set is perfect for creating beautiful button accents in a variety of different patterns. You could use this set together with Button Boutique and the Button Card die collection or entirely on it’s on to create custom cards, scrapbook pages, tags and whatever else you can dream up. Button Up will be available for purchase on November 15th. Button Up contains a total of 12 images. All of the buttons measure 1” in diameter. The button images in this set coordinate with the largest button on the Buttoned Up #1 die. Many of the patterned buttoned can also be used with the medium button on the die as well. 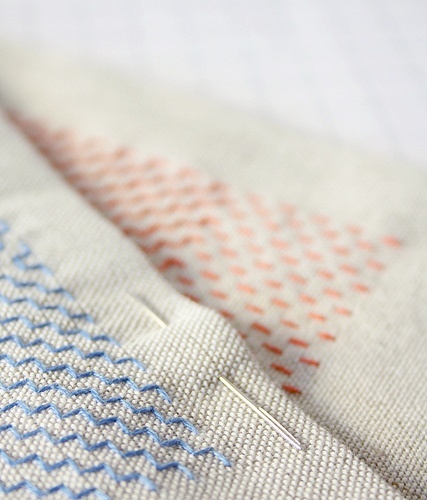 Now it is easy for you to add stitching to your projects without using a sewing machine. With two different "thread" thicknesses, you can make the stitching bold or subtle depending on your desired look. 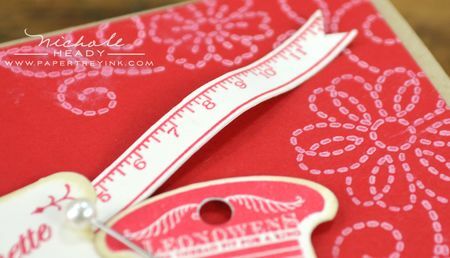 The extra long space allowed at the end of the bases of these stamps makes them easy to line up end-to-end so you can create strips of stitching in any length you choose. Sew Simple Borders will be available for purchase on November 15th. Sew Simple Borders contains a total of 8 images. All of the stitching borders measure about 3" long and between 1/8" and 1/16" wide. For my first project today I decided to pair up the new patterned Button Up stamps with our Notched Flower dies. I die-cut the flowers from Ocean Tides, Canyon Clay & Terracotta Tile cardstocks. I stamped each of them with the largest image from Mehndi Medallion using VersaMark ink. I die-cut buttons with the Buttoned Up #1 die using white cardstock. I stamped each of them with buttons from Buttoned Up. Notice how even though all of the new button images are designed to coordinate with the largest button shape on the die, they can also be adaptable for the medium button as well. I stitched each of the buttons with black twine to give them texture and a more realistic look. The sentiment, from Friends 'Til the End, is stamped onto the True Black background and heat embossed with White Filigree Embossing Powder. The leaves for the focal point were die-cut with the Turning a New Leaf dies from Simply Chartreuse cardstock and stamped with the coordinating images in Ripe Avocado. My next project has a softer, vintage vibe and I couldn't help mixing The Sweet Life with the new Thread Cards. I began with a block of Linen Vellum Cardstock as my backdrop because it kind of looks like Aida cloth used for embroidery. I stamped the "Superior Quality" heading from Button Boutique at the top using Charcoal Palette ink. I then followed up with a bit of Sew Simple Borders stitching on either side of that. The Sweet Life roses began with a layer of Sweet Blush, followed by Autumn Rose stamped off once and finished with Autumn Rose at full intensity. The leaves were completed with two layers of Spring Moss. The thread card began with Sweet Blush cardstock adhered to one of our coasters. I die-cut the Thread Card shape from this and stamped it with a coordinating image from Hanging By a Thread. If you look really closely at all of the thread card images, you may catch small references to some of my favorite books & movies! After stamping, I wrapped the thread card with some floss in a coordinating color. I die-cut more buttons using Vintage Cream cardstock and the Buttoned Up #1 die. I stamped them with images from Button Up, with the smallest one added from Button Boutique. Now for something super simple to recreate and mass-produce. I stamped three of the button images from Button Up using Winter Wisteria, Hawaiian Shores & Limeade Ice inks. I followed up with one of the borders from Sew Simple Borders, angling them to form a fun pattern. I added small stitches to the center of each button with a bit of floss. The sentiment, from Think Big Favorites #22, was added at the bottom using Charcoal Palette ink. As a finishing touch, I die-cut the bottom edge with the Pinking Shears die to reinforce the sewing theme. All of this was adhered to a Winter Wisteria card base. I've always loved the combination of red & cream and I opted to use that as the basis for my next project. I started with the thread cards. I die-cut them from Vintage Cream cardstock and stamped them with their coordinating images using Pure Poppy ink. I swiped a bit of the Tea Dye Duo around the edges and added a pearl stick pin to finish them up. I used the ruler image from Teach & Inspire to create a measuring tape. I made the pieces a bit wavy with my fingers to create dimension and adhered them in place. The sentiment, from a new set that will be highlighted a bit later on this week, was added underneath the thread card cluster with Vintage Cream ink. Finally, I filled in around the thread cards & sentiment with Stitches & Swirls using Vintage Cream ink as well. The Pure Poppy card front was adhered to a Classic Kraft card base. I have one more quick little card for you today using the new Cover Plate: Circles die. I started by die-cutting the plate from white cardstock. I popped out all of the circles and stamped them with various button images from the new Button Ups set using Spring Rain, Hawaiian Shores, Summer Sunrise & Orange Zest inks. I randomly adhered them in place, leaving a blank spot here and there for the background white card base to show through. I added a strip of vellum with a beautiful sentiment from Think Big Favorites #22 added and heat embossed with White Filigree Embossing Powder. I hope you have enjoyed all the creations that I have shared with you today! Are you in the mood to start a new embroidery project or perhaps just dig through Grandma's button basket? What about your embroidery floss….could you use some beautiful, custom cards to put your floss on? Or are you thinking of the gifts you can create with these new items? We would love to hear your initial thoughts on everything we introduced! Please leave a comment on this post to tell us what you think of the new products and you will be eligible to win big! You have until 7am EST, November 13 to leave your comment and be eligible to win. Only one comment per person please. One randomly selected winner will be announced on our November Release Winners Page before noon EST the same day. Thank you for stopping by today and best of luck with the contest! Maile Belles is showcasing Button Up. Heather Nichols is showcasing Hanging By a Thread and Sew Simple Borders. Jessica Witty is showcasing Comfort Food. Wow, I love the new products! Those buttons are great and so are those thread card dies. You have more beautiful projects for today. The thread card dies are wonderful. They will really help some people to organize their floss collection. unbeleivable. I wasnt really interested in the thread cards die and I never got the button dies. I have to rethink this entire thing after seing what you did with them today. Can’t wait to get my hands on all these goodies! Just love the roses from Sweet Life and your combination of the sets is out of this world. Love the red and cream card too. All boxes are ticked, roll on the 16th, no that’s not an error but with time difference here, that’s my shopping day! Thank you again for more inspiring sets and dies. Oh so beautiful’ are the cards today! I really love the button stamps. I am always so torn putting buttons on my cards because of the bulk and I send many through the mail. This set solves my problem! Thank you!!!! Todays sets are fantastic. Love the sewing theme. Great sneak! Love it all! Absolutely beautiful! Love it all! Beautiful cards today- love the thread cards and the button stamps. I have yet to master the sewing machine so the stitch borders will be perfect! In addition to being a cardmaker, I am also a knitter and a needlepointer. I can’t wait for this release! What wonderful projects. Amazing! I love the card with the black background! And the think bigs are so much fun! Such beautiful projects! The thread cards are super cute, and everything fits together beautifully with the whole theme! I like how your favorite books are incorporated into the design. LOVE those thread cards! I do quite a bit of sewing on my cards, so I always have stray bits of floss that I’ve separated and lay unused in a tangled mess in my floss box. This would at least organize them and make them look pretty to boot! Beautiful samples! Like the thread cards. I am a cross stitcher and think it would be fun to use these on some cards! I am a button fan too so the button stamps are a must have as well! Just about the time I think there can’t possibly be anything else that you could come up with, you procede to blow me out of the water…..AGAIN! Loving these needlework inspired projects of yours, Thank You. Lovin’ the thread cards — just adorable! Love how you combined the roses with the thread card!! Love the sewing theme!! Your needlework cards are pretty! i love the new coverplate and look forward to these adorable thread images and dies! Wonderful cards! I love how you paired the Sweet Life with the new set. I can see using the floss cards to get all my floss out where I can see and use it…presently it all resides in little plastic bags on big rings in the bottom drawer of my cutting station. Love the thread cards and the new button stamps!! Your card with the Sweet Life roses is simply gorgeous! Great card samples. The think bigs are a definite must have. Love the thread card references ( series 3 is finished in the uk and we have to wait for the Xmas special for our next downton abbey fix!) I had to google leonowens and then immediately connected her to the king and I – love that film too. So for someone who doesn’t sew you’ve got me interested in a thread card! The stamped sewing is a good solution for someone like me. Beautiful cards! I didn’t think I would need the buttons but you have me re-thinking that! Love the think big stamps! Beautiful as usual! I’m so in love with anything vintage, so your “craft worthy” card really makes my heart happy! I love the new thread cards. What an amazing idea! Can’t wait to get my hands on these new goodies! Amazing projects. Just love the color schemes. Loving all the products shown. I love today’s projects, especially the combination with Stitches and Swirls. Love the thread cards and circles die!! On my wish list. I like the new circle die plate. The sewing theme is not mine- but your cards looks great. The samples are so sweet! Or should I say “sew” sweet 😉 love what I saw in todays post. I am eagerly awaiting the full reveal! Jaw dropping perfection Nichole! Your cards are worthy of frames! Looks like I’m adding to my collection of sewing themed stamps. I have always loved the sewing theme. The thread card dies are wonderful! Looks like a great release; thanks for the inspiration. I need those thread cards!!!! Love the sewing theme this month! The button stamps are so cute! Papertrey ink does stamp versatility “sew” well! I love the “Sew Simple Borders” set! Always love the Think Big Series. Very useful. I did cross-stitch for years and years, and have always collected buttons, so these sets are a welcome addition to your beautiful stamps sets! Love the card where you mixed the stepped roses with the buttons and thread! I love the buttons and the cover plate circle die together! I love the new set. I already own the previous set of buttons and dies. This would be a lovely addition. Beautiful cards! 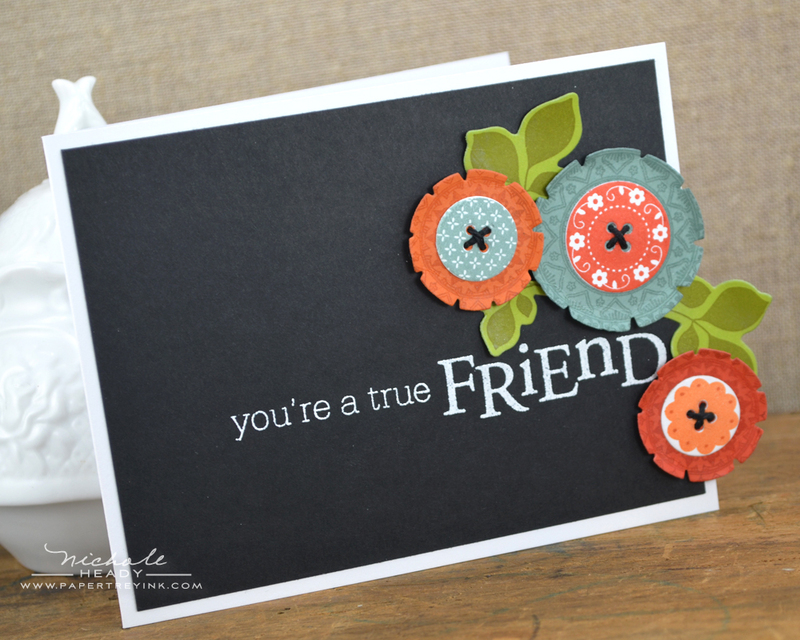 I am in LOVE with the circle die – it is a great compliment to the hexagon and diamond dies! Using the button stamps for the circles is genius!!! Everything is adorable! I especially love the stitched borders…great for those times I don’t want to pull out the sewing machine. What great stamp sets for the knitter or sewer. And the button set – it really solves the issue of using real buttons and trying to mail them. Beautiful projects. Looking forward to the new sewing theme. Really heart-warming cards using all the sewing stamps, I’m really liking what I see so far of the stitching borders, great for added interest and background stamping! I like the new cover plate with the circles and the colors used in that card are really beautiful. Nicely done! My wheels are spinning with ideas for the thread cards. The think bigs are some great sentiments! Love the new think big favorites and thread cards! Love the buttons and that thread card!! I have so much of my grandmother’s embroidery floss that I would love to wrap around those thread cards as cute storage to display or to add as an embellishment to a card! I’m loving the buttons! Great patterns to use. And the sew borders look cool. Wonderful, amazing, exciting and like nothing that’s already out there!! Thank you! Another day of great projects, can’t wait to see more!! I love the circles cover plate! The cards are beautiful! Love the new sewing inspired dies and stamps. The new Think Big Favorites 22 set is a must have too! Another great day of projects! Love the comfort foods and button stamps! Love this time of month! Loved Erin’s ‘real live’ popper, great for the Thanksgiving table. I also like the idea of making my own thread cards for my floss box. More wonderful cards and inspiration! I love the buttons, the sewing borders and Erin’s use of the Movers & Shakers to make the inside of her New Year’s card look like it exploded. Nichole and the DT are the best!!! I love to sew as well as make cards so all the new items are Wonderful! The color combinations are great! The featured projects are amazing. I love the new button stamps and thread cards. Love the sewing theme and the floss cards. Love that there are varieties. Once again, your inspiring ideas are just waiting to be re-created! Beautiful cards – I didn’t think I was interested in the thread card set until I saw your fabulous ideas – wow! Loving the button and stitching stamps! You make it all look so easy. Thanks for the great ideas! Really loving the sewing theme, and especially the buttoned up set! I love that you used buttons in the new coverlet, what a great idea. Love the thread cards. I can see so many uses for them. Lovely projects. The new thread dies will be so much fun. These thread cards are beautiful. I use thread cards to store all of my ribbon. Now I can make my own and make them beautiful! Loved the sewing theme, a lot of good ideas for cards. I am excited to see the rest of the stamps and dies to go with this fun theme…loving the buttons, stitches, and thread cards we’ve seen so far. Love your cards. Thanhs for sharing all your beautiful ideas. Can’t wait to order. I love the stitched borders. They will add a fun detail to cards and scrapbook pages. I also really love the floss cards. I can see using them to make a gift for my sister, the avid cross stitcher. Thanks for the great ideas! Cover Plate: Circles with the button stamp…delightful! Love the new products. And those buttons come in handy. Buttons are a great addition to the line. Makes mailing cards more affordable. So many options. Thanks for all the fun inspiration. I love Think Big Favorites and the Thread cars are fab, too! I’m super excited about this new Hanging By a Thread stamp and die set. This month’s release is just in time for all those craft items we make for Xmas gifts! The design team always gets my creative juices flowing as I see all the ideas that you have. Thanks for sharing. Love the new thread cards! Such fun stuff this month! Loving that circle cover plate! I can see so many possibilities with it already and we’re only a few days into the release samples!! Can’t wait to see the rest! I am sooo excited for the new releases. I love them all so far. Not sure which ones to get first. Love the sewing theme!!! It’s simply awesome!!! The button set is definitely on my list along with the circle coverplate. Totally my style. Lovely cards! I’m always using buttons on my projects!!! How great to stamp my own designs!!! Love it!! Another day of wonderful sample cards. I think the Circles die cover plate is a must have. It’s darling when the circles are stampted with button images. Soooo AWESOME…these ideas are totally up my alley! Love it! The thread cards and buttons are so cute! Also, I love the Think Big Favorites. Thanks for sharing and for the great ideas! Those little thread cards are adorable! Great projects today! All the new products are so lovely. Great ideas and peeks!!! Button & Thread what a perfect pair. Love it! I’m in love with those think big sentiments! Love the buttons and the think big set. I’ve been waiting for some more “stitchy” stuff like this! Oh I just love the thread cards! What a wonderful idea and such beautiful cards. I am so excited about the Button Up set! This set will be so versatile and useful in so may ways that is is definitely a must have for me! Love everything about today’s post, as I love sewing and cross stitch! Can’ t wait for the 15th!! Really great cards, I think the button and thread theme will be a lot of fun! My favorite new item is the circle cover plate! You have inspired me! The card with the roses is gorgeous!! I love the embroidery floss cards! So pretty and versatile. OMG! The thread cards and buttons are adorable! I love it all. Lovely cards and I simply love the vintage sweet life roses card the best!. I am looking forward to the thread cards! Wonderful inspiration! The Sweet Life card is particularly beautiful. Love the sewing genre! Love the cards and the new items, more fun ahead! Oh my, LOVE those Thread Cards! Must have, I say. Those buttons are beautiful too. Love, love, love. Since I do a lot of embroidery, I love the new thread card dies and stamps. Oh, Nichole, you naughty girl – you have done it again! That roses card and all the trimmings really does look like it is hand-stitched. I did not know how you’d top yesterday’s post, but you have done it again. As an avid cross stitcher, I can see lots of possibilities with this month’s release. Those thread cards are exciting. Thank you. What beautiful sample cards. The cover plate is a must, along with the Buttoned Up set. I have enjoyed collecting and using the Think Big sets and this new one is great! I totally love the sewing theme! Can’t wait to see the entire collection! I can’t wait to get my hands on those button stamps!!! I have always loved buttons and embroidery. I began my crafting with sewing and counted cross stitch and love recreating it without all the time and supplies! I suspect these sets will make it into my stash! Oh such beautiful cards. The button set is so versatile. So looking forward to the complete reveal! Cute, cute, cute! Loving the buttons. With real buttons you get so much bulk but with cs buttons you don’t. But just plain cs buttons tend to look like cs. With these, they will look more realistic. I learned to cross-stitch as a girl, so these cards bring back a flood of nostalgic memories for me. On top of this set just looking lovely, I’m sure there are a lot of needle-workers out there who are super-excited at the prospect of making their very own cataloging system. 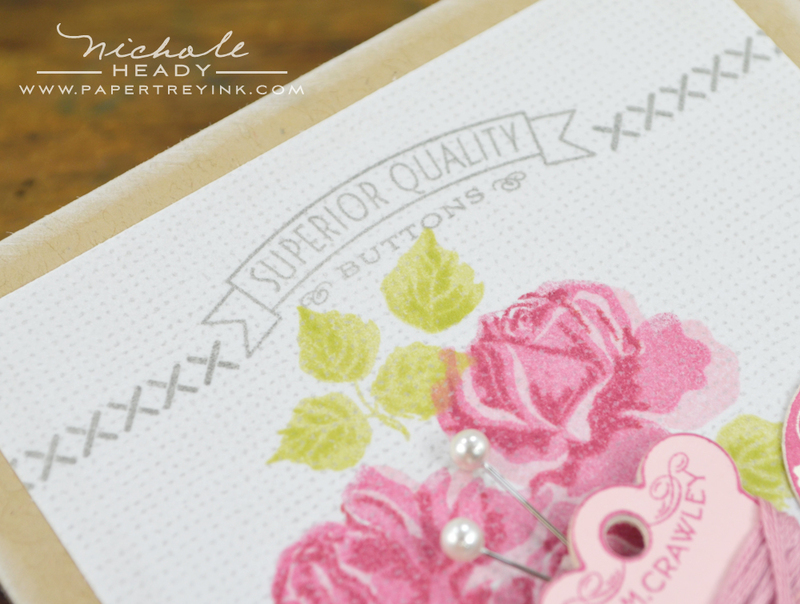 I also love the look of the new buttons with the notched flower die. They go hand in glove. Back to the craft room…can’t wait to see more tomorrow! So much goodness in today’s posts, so looking forward to this month’s release! Wow! I love the choice of Think Big Favorites this month. 🙂 And why wasn’t “Little Labels” on my radar?! Yikes! 🙂 As always, these cards are stunning! Loving the cool shapes of the thread dies! Love all the little buttons and die cuts! Cute projects today. The cards are “sew” cute (Ok, I couldn’t resist!)! I do love them, though. They bring back memories from my cross stitching days back in high school and college. I didn’t realize how long it had been until I really thought about it! It was cross stitch that started my crafting obsession! I love putting my thread on thread cards, but have never thought of using them as focal points on cards before! Fun idea! Also, Think Big Favorites has to be one of my favorite series yet! Love them all! I love all of this! I can see so many uses and can’t wait to see more. Every time I see what you do with the new stamps and dies, my list changes! Love the buttons and circles die. I absolutely love the buttons, stitches and thread cards and all the projects you created with them!! My mom is into stitching, so I look forward to making cards for her with some of these great new products. Thanks for the chance to win! The buttons weren’t even on my radar during the peeks. Your post today had moved them up the list for me. I think these will be great for adding dimension without bulk in my PL album. I’m loving the faux stitching. And I really like the versatility of the cover plate die! Can’t wait for the 15th! I quilt/sew also, so I’m very excited to order! All the samples are adorable! I always but all the ‘stitch’ stamps I can find! I love all the inspiration in today’s post! I just love the circle cover plate with the buttons!! Great project, love it all!!! Everything is just soo lovely. The Thread Cards make me so happy. Totally cool! Love how the new buttons and the circle coverplate work together!! I KNEW from the sneak peaks, that these sets were gonna be on my wish list–so beautiful!! That Craft Worthy card is STUNNING! Thanks to ALL for the great inspiration! My birthday is today and these sets seem to be made with me in mind! So much fun! Perfect projects from the team today! Loving the way older products are being combined with this month’s releases. Very inspiring. Gorgeous projects as always, Nichole! I am beyond in love with the “Crawley” reference on the Hanging By A Thread Set – I might just buy that set just for that one stamp! LOVE IT! The cards are beautiful. They are great projects that just make me want to purchase the new sets! Oh my goodness, I am thrilled to see these cross-stitching and embroidery products! I have enjoyed cross-stitching all my life, and I can envision lots of fun projects with these supplies. More beautiful inspiration from you all today, too. Love it! Oh, Button Up is just calling me….but along with the circles die – PERFECT! Love the comfort food ideas. The the DT samples are great! love the stitching and thread cards!! Oh, I love the button cards and the sweet new button images! Perfect addition to Button Boutique. Lovely samples as always. Beautiful cards….what seamstress isn’t going to fall in love with the sewing series. Amazing samples today and they really touched my heart, as I’ve just fallen back in love with sewing since having to replace my 31-yr.-old Singer. Such sweet ideas for adding buttons and stitching to our paper crafting projects!!! I’m really lovin’ the sewing theme this month! So many cute ideas! I’m so excited about today’s post! You have combined two of my favorite hobbies and put them into beautiful cards. Love all of the projects, can’t wait for the 15th!.. Buttons have always been a favorite of mine. I keep a giant jar on my stamp desk! Great projects today! OMG! Next to stamping I adore doing needlework. I must have those new stamps and dies to make all my own tread holders. I cannot wait until they are available.Cheers. Oh my gosh, I just love, LOVE those floss cards! Your cards are so sweet, and I love how you incorporated some older sets with them! Such a fun release! Lovely cards today.Your card with the Sweet Life roses is simply gorgeous! I love the sewing theme, and you hit it on the head with the thread and stitching stamps. The rose and thread card was beautiful. Great card samples today!! Love the button, as these will not add the bulk in mailing. Love, Love the Sew Stitch Borders also, cant wait for more! I’m loving the buttons, thread cards, and stitches! And the circles coverplate and I love roses. I could go on. You all make cardmaking fun and easy. I love the thread cards—soo pretty. Lots of great new products this month. So many cute things this month! Going to be hard to choose…. I look forward to this every month.I love it all! You guys come up with things every month that I can’t go with out. I’m going to have to start rethinking my storage stiuation in my craft room. 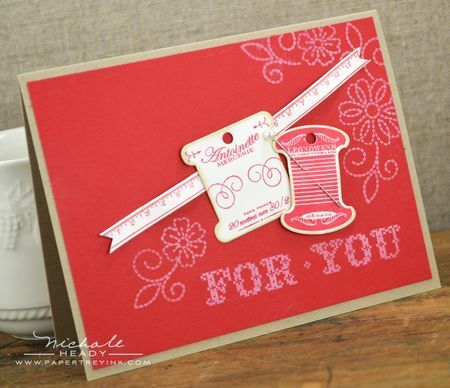 Love the thread card dies and stamp set. Beautiful projects overall. I love to sew, and these would be a fun addition to any card or tag! Love! I love all the cards from today but my favorite is the pink flowers with the thread. So vintage looking and lovely as can be! I am loving the needlework theme this month and cannot wait to get my hands on those little thread cards. I’m hoping there’s something for those of us that crochet, too, but if not, the cross-stitcher in me will be quite happy. Thanks. I’ve been a sewer since I was a child … and not always as a fan of the craft, but I have learned it is one of themost useful skills I have. These sets are so wonderful, your execution of an idea is outstanding and I look forward to adding to my stamp collection. Sewing is something that I do not enjoy, however, I can definitely enjoy creating cards with these stamp sets because they are too cute! Love the thread cards, so cute !! The sew simple border is fantastic, too ! Oh my! From someone who loves sewing, ALL of these products today make me happy!!! I love the images on the buttons in the Button Up set. Can’t wait to see them all. Amazing cards. The red one really caught my eye, because red always does! 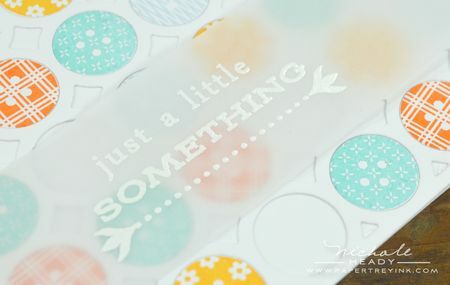 lots of great ideas…i love the new button stamps! those embroidery cards are great too! Buttons are great! I love the Thread holders! I know a lot of people who would love to see those on a card! WOW! I love the samples!!! The new sets and dies look so much fun to play and create with! Such lovely patterns and embroidery motifs! My favorite is the notched flowers card today. So nice with the button centers. I can see this with felt flowers, too! Thanks for another inspiring release day. Nichole, I am so in love with your post today! I cannot stop looking at you card using The Sweet Life and the thread cards! It is so stunningly beautiful! Am thrilled to see the new Buttoned Up set in action too, as I bought these dies awhile back but haven’t used them much. This set is a definite must-have! I love it all today!! The card with the Sweet Life roses is so beautiful!! I will copy your stunning red&cream card … and the first one also! Love, love, love the thread cards! Beautiful projects today! Love all the sewing themed items. Going to try the red cream color combo, love that. I love to see mixing the new release items with the current products. It makes me pull those things out and INK them again! Lovely samples! Love the sewing theme this month. It’ll be so much fun to create my own vintage-looking embellishments! Thanks for all the inspiration! The Thread Card dies are my fave!! 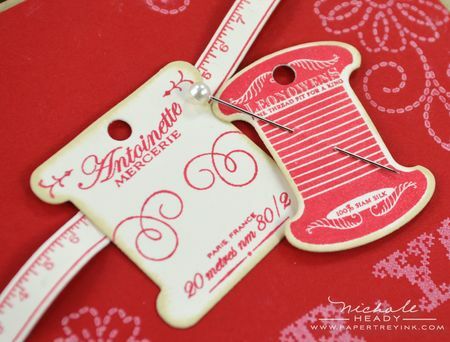 I have a feeling that I’ll be spending big this month…..
Love, love, love the measuring tape made from the ruler stamp!! I think the thread cards are beautiful and the little stitches stamps will be a match made in heaven. I love those spool and thread card dies. What possibilities. This release is right up my alley! Love the Sew Stitches set! Such a lovely theme this is! Love the handmade feel of the projects. So many possibilities!! I love the thread holders! Just love the Thread Cards and Hanging by a Thread – am excited to see the set fully revealed!! I can’t wait to get my hands on the new sewing related sets, just fabulous. Every card is gorgeous. This line totally reminds me of my mom. The second card, “craft Worthy” is totally my mom’s style. Thanks again for warming my heart. I am so excited, can’t wait to shop! And the hits just keep coming. Your are all amazing. New projects, new color combinations EVERY month, WOW! I don’t even sew and I think these cards are beautiful!! Sew Simple Borders is the stamp set I’m anxious to see. I dread the thought of pulling out my heavy sewing machine so would much prefer to stamp those stitches! I love the thread cards! Great inspiration as always! More wonderful projects! Love the cute flowers on the black card stock –so striking! I don’t sew but these sets are so adorable, I might have to “sew” some cards! Fun cards with all the buttons! Thank you for the inspiration. Love the new Think Big Faves. I can’t tell you how much use I get out of all of my $5.00 stamp sets!!!! So worth the money!! ummm…this is my favourite in a long time…i love the sets you are showcasing today. oh, dear. i wonder if i can send links to santa? Cute, cute…makes me want to get out a needle and some embroidery floss! Love the new circle cover plate. Thanks for all the inspiration again today. Oh I love sewing themed things. I hope this means the linen vellum is back in stock – I’ve been after that stuff for a couple months now! So looking forward to the full reveal of Hanging By a Thread! That one looks so very cute… Plus I love all of the little movie and literature references! I’m in love with the buttons! Your projects are so inspiring, as always. L.O.V.E. those thread card dies! And, Think Big Favs #22 is a must have! Beautiful cards today- love the thread cards and the button stamps. The think bigs are a definite must have. I love all types of floss and thread – the thread cards are just so unique and fun. Love that idea. Love all of today’s projects, especially the Floss dies. Love the designs. Always such fun to see the monthly samples. I am a Think Big fan. Those buttons are great and so are the thread card dies. Especially I love the red thread card. Sorry if this is a second post but my original post did not show up even after refreshing twice! There are wonderful new products for the sewing/knitting enthusiasts this month and it will make it hard to decided what goes on my monthly order. I’m loving the sneak peak of the new Aida Cloth IP! I love the neat and clean style of all your cards! Not to mention the versatility of the stamps you guys create! I love the buttons! So cute! i’ve loved the button dies & stamps since I saw the sneak view!! It’s gorgeous and would really add to my embellishments! The buttons are so sweet. I do love the names on the floss cards. Oh, great projects and great new products – love them all!!! Thank you for inspiration!!! Love all the sewing products and ideas. Just SEW crafty! LOVE the vintage thread cards!! LOVE all the new products!! Thanks a lot Nichole…now I NEED those thread cards, thought I was going to be able to resist, but no way now! Love this month’s Think Big sentiments too. The floss cards are so adorable! Since I have almost all the colors of floss, it would be too daunting to customize all of them, but these will make cute greeting cards and gift tags. This month’s Think Big Favorites is also a must have. Thanks for the chance to win a gift certificate! Each day is better and better, just like always! Love those thread cards! Another think big favorite that I suddenly can’t do without. Funny how that always seems to happen. All great cards! I can’t wait to purchase the button up release! Another great release! Nichole, I don’t know how you do it. Each card project is more beautiful than the one before. I especially love the Craft Worthy card. The color combination is spot on! Amazing samples again today and I just love the new Thread Cards and buttons. Swoon. Very pretty cards and love the new thing big sentiments! Soooooo much creativity!! Really loving the buttons and thread holders!! Love the floss cards! I’m looking forward to seeing more of the stitching stamps – I’m about to give up machine stitching on cards – this will be much quicker and more fool-proof! Loving the sewing theme – so clever! So many pieces to play with. I also love the new Think Big Favorites – keep those coming! Just beautiful. And it’s always SO nice to get ideas for flat stamped cards that I can make quickly on a moments notice! The rose card is simply lovely! What a great use of the little thread card. I really enjoy cross stitching this new set with the dies is sure to please. How innovative! The for you card topped everything off so well , can’t wait! I really like the new thread card dies. Embroidery floss can now by stylish! Really like the buttons and the sewing theme. The cards are beautiful! I always thought you were a kindered spirit but when I noticed the name of one of the embroydery card stamps that confirmed it! Anne of Green Gables is still one of my favorite stories! thanks for designing something tht brought back some wonderful memories! **swoon** Buttons, stitching, vintage… I love it all. I love the thread cards, I can wait to have them! Your Craft Worthy card is just gorgeous. WOW…love them all!!! I started to place an order today, good thing I decided to wait. Love all the new sewing inspired sets today. Love how Heather and Maile used the little $5 stitches set. Thank you for all the FABULOUS inspiration! I am love, love, LOVING the button stamps! These will totally go with all of my projects… and the sew simple borders? Great way to do some faux stitching really quickly! You girls knock it out of the park every. single. time! Beautiful card samples today. 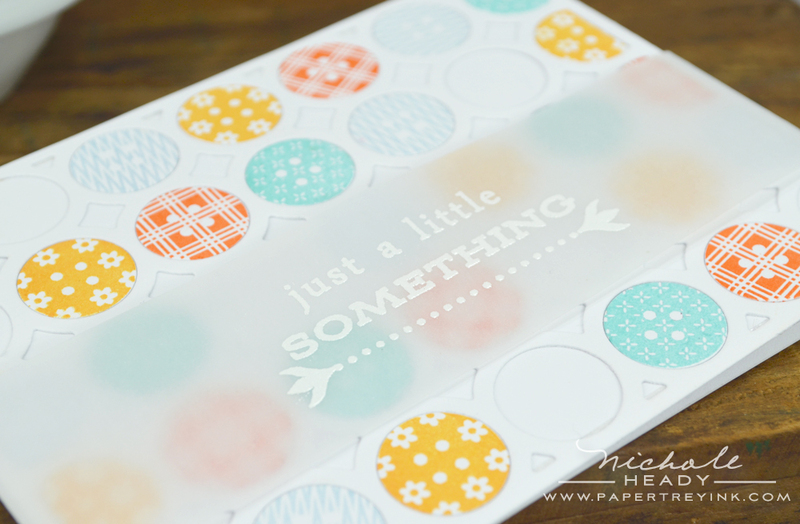 That button stamp set is so cute and versatile. These are lovely, thread & needle -inspired projects and stamps! Cute and crafty. Love all the stitching and the paper buttons. Beautiful cards today! Totally love the button stamps! And the Think Bigs! And the…all of them! Loving the new cover plate! Thanks for all the inspiration you give us. oh, those little spools are darling! And mixed with my favourite button card images is pure bliss! So many lovely new dies and stamps and samples also. Can’t wait to see what all of the other designers came up with. Wonderful projects today! I love the new thread cards stamp set and dies. Lovely projects! Your cards never fail to inspire. I love the button stamps – I wonder if they’d work with the smallest button die? How adorable 🙂 Love Button Up and all the awesome ideas. What cute card samples! The Think Big stamps will be so useful. Love the little spools and button images – especialy how they fit the new cover plate. And all the projects are amazing! So far, everything today is my favorite from this release…I’m putting the items showcased on my wish list for sure! More gorgeous projects today! My shopping list is getting very long…. :) thread cards and button up sets are super cute! Great projects! Love the new stamps & dies this month! This month’s release is “sew” much fun, I can’t wait for the 15th! Love the thread cards for embellishments and also for wrapping some twine on to share with friends. Great projects! My favortes are Crafty Worthy and For You. Stunning! What a fabulous assortment of projects to inspire us! Beautiful cards, I love the button set. Sew much fun (hah). Great release so far. I just adore that Think Big Favourites #22, awesome! Textiles are my first love. Looking forward to merging it with paper crafting. I am soooo excited about the stitched borders. What a great release to ring that homey, cozy feeling that comes around this time of year. I can’t wait to use the new Button Up set with the original Button Up dies. Beautiful samples today, Nicole. The Seewt Life card is my favorite and I love the literary references on the thread holders! Such beautiful projects, today! Love the Think Big Favorites #22! Love those thread cards! The perfect way to share baker’s twine with friends or make up a craft kit as a gift. Those thread card dies are just lovely! Lovely, lovely projects with these new releases! Love the white embossing on the vellum. Especially pretty on the circle cut outs. Thanks for the inspiration. Love all the sewing related sets. Those new thread cards are darling! I am loving it all! I am so excited for this release. Thanks! I’ve always loved embroidering & sewing & these are just adorable. Beautiful examples using all the fun new items. Thanks so much – you are amazing. I love embroidery but its too time-consuming for me to take on. I’d rather just purchase something. Great cards and love the new dies! 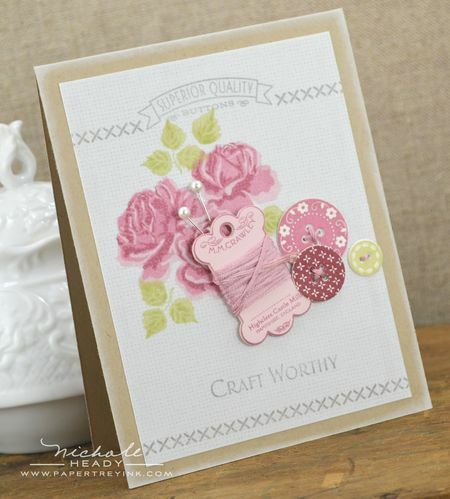 All the cards are beautiful but my absolute favorite is ‘Craft Worthy’ – love the soft vintage look. Thread cards die will be useful as well as decorative. Thread card dies are just gorgeous!! Ok, so I just thought I was going to be safe this month but after seeing todays sewing fun stuff I will be ordering again this month. Thanks Nichole and team for all your hard work and inspiration. Wow, such charm in the sewing cards, stitching and button stamps. Love them! These new products make me want to make embroidery gifts for Christmas with coordinating cards! I can’t wait to get my hands on these new products! I just love all your cards…also love how all the stamp sets coordinate together at one point or another. The circle cover plate is fabulous; it provides such great texture! And the notions-themed goodies are right up my alley. I could see myself using the cards to wrap some fun fibers to give as part of a card making gift. Beautiful cards. Those thread cards are fabulous! Lots of great inspiration today with these new sets! beautiful! i think of my great grandmother seeing these creations. her pegboard wall of spools of thread and hanging pockets of thread and button cards mesmerized me as a little girl. she would have LOVED this set! BEAUTIFUL samples!!! I’m lovin’ the new think big set!!! 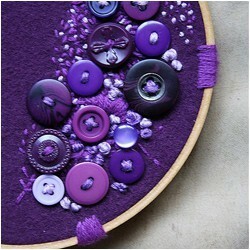 Buttons and thread – love it! Fabulous samples too. Once again today, my favorite card is the one with the bright pop of flowers against the dark background! I really have to sit down and make some cards that way soon. Thank you for all of the wonderful ideas every day! Love the cards made today. I like the buttons and stitch border. The thread card dies are THE BOMB!!! Thanks for all of the pretty inspiration ladies! I love the Think Big sentiments – I also have to have the new circle die – LOVE! Thanks for the chance! Another day of amazing inspiration. It just keeps getting better. Beautiful cards! I really like the needlework look — really nice! Just love when it gets so close to the 15th every month. I always want everything = sooooo hard to make decisions. Can’t wait! i love the buttons and since i don’t sew these stitch borders are perfect. i used to do counted cross stitch, these cards will be great for my floss i no longer use. thanks. Great samples today. Looking forward to release on the 15th! I LOVE using paper buttons and these are the sweetest button stamps I’ve ever seen! No question – a “must have” for me! Great release! Loving all the button choices! Everybody is rocking the projects! Wow. Beautiful projects. Amazing how you can keep coming up with more wonderful things. I was (past tense) an avid cross stitcher so I have scads & scads of floss just waiting to be wound up on one of these darling spools! Love the theme of this release! Lovely, inspirational projects! Those buttons and thread stamps are a must have. You have some fantastic samples. 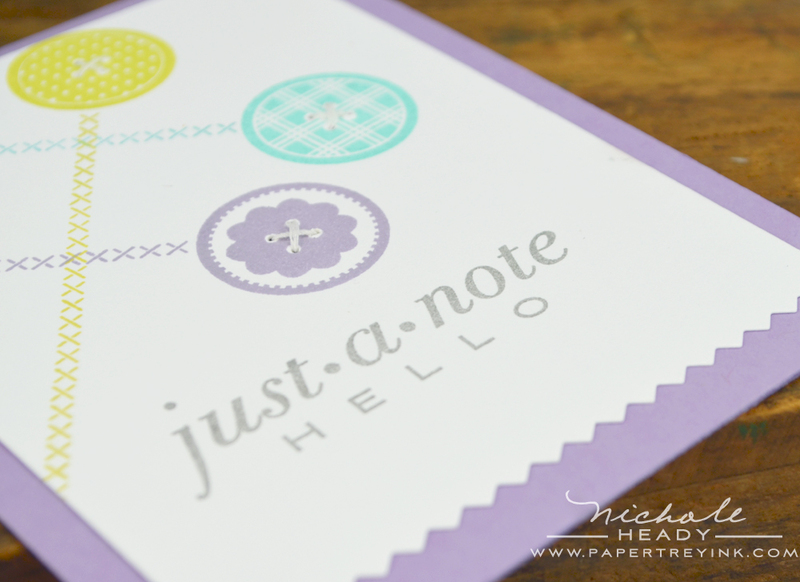 Love the simplicity and the colors of the Just a Note card. I’m a big fan of the Think Big sets – they come in handy so often! The sewing theme is adorable, and I love how it coordinates with Stitches & Swirls,one of my favorites. I may have to break down and get those spools – I love the vintage look that can be created with them! You can NEVER have too many button styles; I can’t wait to use PaperTrey’s new set. I love those little thread cards. You make such pretty cards with them. Love it all, the projects are fantastic! I thought yesterday’s cute soup cans were going to be hard to top, but it looks like you’ve done it! Really lovely – great homespun feel! Wow, I love the new sets and the samples, too! How DO you come up with these great ideas? Love the new stuff and great inspiration! Gorgeous projects, every one of them! I really cannot wait to get my hands on those thread cards and buttons! Exciting examples today! Looking forward to the release! Love the thread cards! Today’s products are must have for me as an avid sewer/quilter. Love all the stitching inspired projects today. Buttons, threads and stitches…Oh, My! A new cover plate? I am ecstatic!!! What fun new sets for crafters at heart! Thanks for the inspiration! Oh I am in LOVE!!!! That is all I got to say!! 🙂 Cant wait to SHOP!!! What a beautiful collection of goodies today! Honestly I have never seen anything you or the design team has done that wasn’t absolutely amazing. You are so inspiring to me Nichole. What fun cards! I especially love those button stamps! Love the thread cards!! Beautiful examples. Can’t wait for the 15th!!! Beautiful samples to showcase these new additions! I just love the button stamps paired with the circle coverplate – and the new Think Big Favorites are definitely going in my cart. As a needle crafter, I am so super excited about the theme this month! More great products and projects. Love the circle cover plate! I love all the stamps, Especially buttons!!! and I love the lase card, so soft. All of the stitching products are sending me over the edge! Love them all! The floss card dies are awesome and I can see myself making all new floss cards for my cross stitching projects. The Craft Worthy card is my favorite. The linen card stock does make it look like aida cloth and the stamped images look to be stitched. The floss card with a bit of embroidery floss wound onto it is a sweet embellishment. The buttons are a nice added touch to bring all the stitching elements together. Love it all! Beautiful products and wonderful inspiration as always!! I am loving the button cards! Perfect for all kinds of speciality threads! I can see me using those forever! Such lovely samples today! I love the thread cards and can’t wait to see all of the images in today’s sets! Back before I took up card making as my primary hobby, I was an avid cross stitcher. I had a nice floss collection which I eventually passed on to my step-daughter as I began to spend less and less time with it. Brings back great memories! LOVE the little ice cream cozy from Jessica. 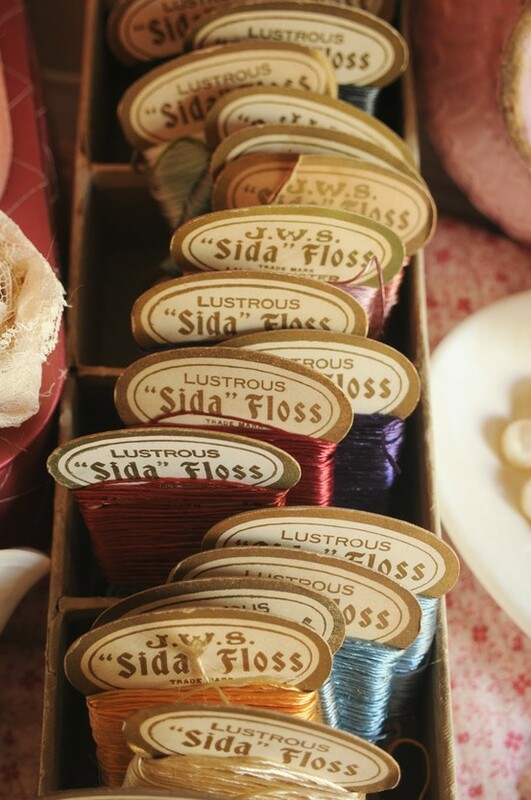 And as a former avid cross-stitcher, I have tons of floss that I need to do something with. The little floss cards are perfect! 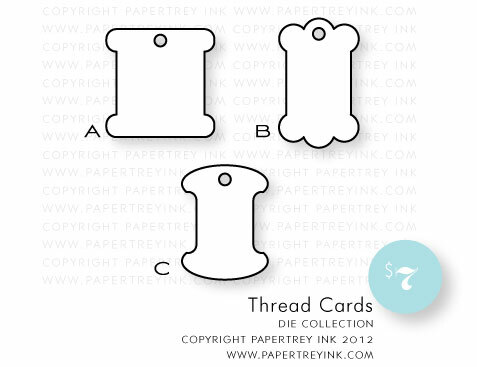 And the buttons… flat buttons… such a great way to add pizzazz to your card without the bulk. Love your literary references too! Oh be still my heart! Sewing is my first true love of creating. I have been doing it since I was eight! Paper crafting comes in a close second though so I love the new sewing inspired products. Keep up the good work! The thread cards look pretty cool. Can’t wait to see more! Absolutely beautiful! I love that now my hobbies have been mashed up together– both knitting and sewing. The cards are too cute! Another day of fabulous goodies! Love the thread cards! Looking good! Will be placing an order this month for certain! Love theThread Cards! They are such a great addition to all the wonderful Button Bit sets!! I love the button stamps and thread “holders”! How cute! Can’t wait to see the rest of the release!!!! I love the stitched borders and buttons! Everything is so nice! Keep it coming! I adore thethread cards! I could see using them in so many ways in my sewing and craft room! Love Nichole’s cards today, so beautiful. I really love the vintage look. Love the thread cards! How do you all keep coming up with these amazing designs – both the stamps and the cards? Wowzers! Beautiful products and projects, love the buttons! Your samples are always so great. I also love your color combinations. They really show off the new products. HOly MOly! Those buttons are so stinkin’ cute! Especially in the new coverplate. I really love the idea for homemade floss cards. So Fun! And the vintage feel of hand stitched projects reminds me so much of my grandma. 🙂 It is all Fabulous! I love the ‘Think Big’ stamps. They are so neat!! Great samples today! I have been looking for a cute thread spool die! Love that it comes with some cute stampable images. Love the fancy button details centered on the flowers on the black card! Love all the button cards and stitching stamps. Don’t have to pull out the machine any more! My sister owns a quilt shop so we are big fans of all things fabric and thread. I can’t wait to see the rest of the products being released this month. Sewing and Knitting and Embroidery…some of my favorite things! Loving these new sets and all the beautiful samples! Absolutely in love with these cards!!!! I so want those thread cards, they are pretty with anything!!!!! Craft worthy! 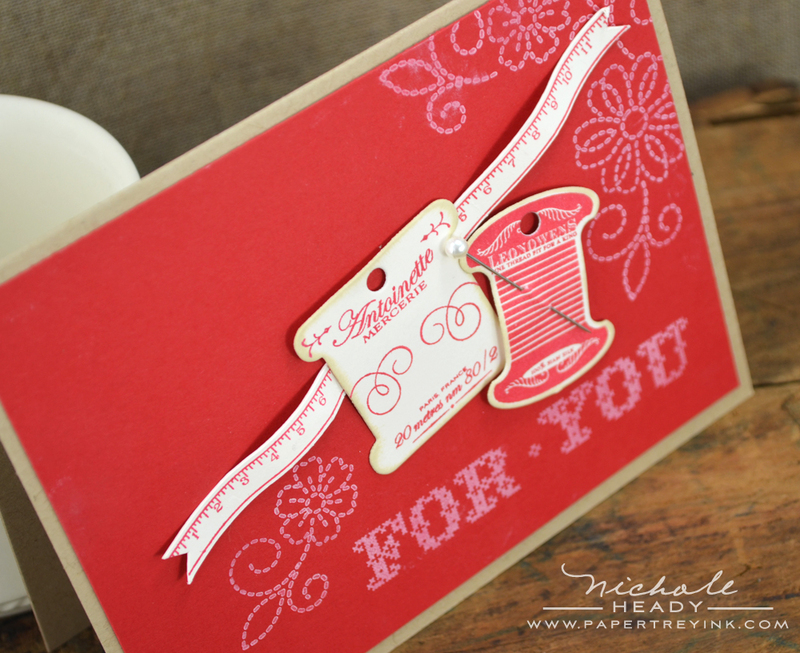 What an awesome sentiment for a card- the card with the thread spool added to the front is definitely a favorite! WOW ~ these are making us all “sew” happy and in the mood to create. These are totally awesome. Especially love the buttons, TBF (feel better soon ~ so needed) and the stitching lines. You gals rock with your creativity! Love the thread card dies. Perfect compliment to what I have already. Wow, I’m loving that black background! I never think to pull out the black. Awesome sets!! I love the border set!! Can’t wait to add those floss cards to my sewing collection of stamps and dies. Love them! Looked at today’s selection with my 4 year old grand-daughter, I would say “cute” and everyone after she would say “more cute” with a giggle. Thanks for a fun show. I’m really liking Comfort Foods – Jess and Lexi, your projects today are wonderful! I love the thread cards! I’ve been wanting thread cards for a long time to keep track of all my twine – in style! For anyone that has sewn a button on a shirt this is a must have set. Love the choices of stamps and dies. My friend Sandy will be loving this set too. Wow that agreat bunch of projects love them all..
Oh my! 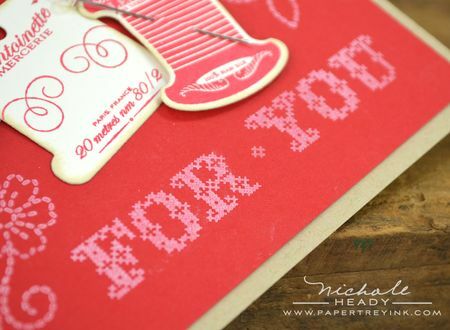 Love love love the idea of thread card! 🙂 beautiful creations! What fun! I love the Think Big Favorites sentiments this month, and the embroidery-themed cards are stunning. I love embroidery themed stamp sets! Beautiful & Inspiring! It takes me back to when I was a little girl….I grew up with my mom cross stitching. I always thought it was the neatest thing. I love todays offerings. My sister is a cross-stitcher and my mother does heirloom sewing. These sets are a must have, especially the thread card dies. super cute! I love the Think Bigs.. they are always a perfect addition to my collection. I totally love your cards today, the colors are gorgeouse! Love the patterns in the button up stamp set! The thread cards and button shapes are adorable! I love to make quilts, and these new PT items would make adorable cards to coordinate with my sewing. Wow! Another great release day! I love the thread cards and new button stamps! Can’t wait to order! Oh I love these sets so much – buttons & stitches & thread cards, all so adorable. Can’t wait to get my hands on these stamps & dies. I love the refrence to Downton Abbey (my favourite tv programme!) in the new cotton reel stamp set – very clever! I love the thread cards! Fun way to use up some of the pins I’ve been hoarding! I love the whole sewing theme!! Love those buttons, super cool! Great cards too. Those thread cards are to die for love them. What beautiful cards. I’m loving everything I see so far. Great projects today. The thread cards are so cute. Can’t wait until the 15th! The new circle cover plate is the die for! The detailed buttons are just wonderful. So versatile. I cannot wait to get my hands on the new releases! I love the gift ideas that were shown. Jessica Witty is so creative with her gifts. I am really excited about the homemade gifts that can be accented by these great stamps and dies! Love the thread stamp set! I have a cross stitcher in my family and can see many projects made with this set for her! 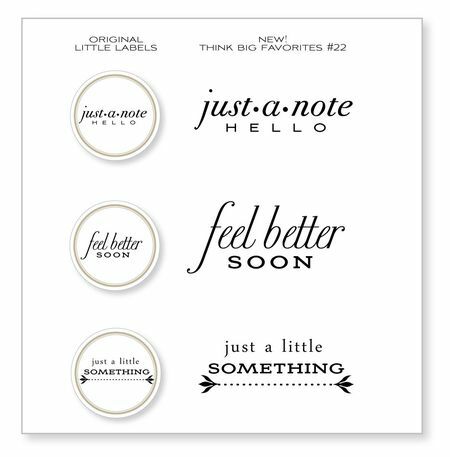 Love the Just a little something card! The cirle die and the color combination are awesome! Fabulous! I especially like the sewing theme on some of your new goodies! I’m so excited, can’t wait for this release. Just, hmmmmm, good. Fantastic. And I am lovin’ all the Think Big Favorites. I bought the original set years ago, and have enjoyed adding to it. I use it over & over. Love the new buttons & your circle card is just terrific! I love the sewing themed stamps. All the projects today were so cute! Love it all. The thread cards are going to be awesome! Sentiments are always a must have item..love them as always. And the thread cards are fantastic! Love the new Sew Simple Borders set. I also like this months Think Big Favorites set. Can’t wait to see more! Wow, more beautiful cards today. The thread cards are so awesome. WOW each release is getting better and better ..how is that possible as I LOVED each release already so MUCH!!! It’s all STUNNING..LOVE your cards..LOVE it ALL…HAVE TO ORDER!! My list is getting too long of my favorites! This will be a hard month to “hold back”. Love all your samples. Very interested to see the rest of the designs for the thread cards. As a cross stitch addict, I am hoping to see some familiar names. Love the button designs too. I cannot tell you how much I love these thread cards and everyone’s projects having used them! They are stunning! Love the thread cards, the cover plate which the buttons fit in is awesome as well. Great samples and wonderful ideas. This is one of the few releases I am so excited about, I may order on release night! I have a blast with the button cards and this goes with it so nicely! Probably my most used set other than mega mixed messages! I love sewing themes so yeah! Stitching stamp set is just perfect for those who can’t stitch… like me! I love heat embossing! Also love that there’s a new use for the ruler in my teach n inspire set..Thank you! Really like the new circle cover die. Your samples are beautiful as always. Love the thread cards and the card plate. Oh no!! Thought I would save some money this year!! Beautiful cards. Love the button stuff and the card with the roses on the linen vellum. Love the “think big” sentiments! 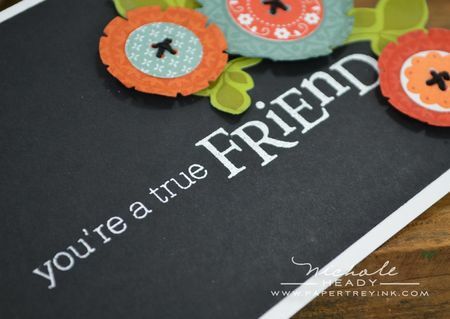 And every time I see a sentiment embossed on vellum I think I MUST try that sometime because I do so love the look! I’m loving the stitching stamps and notions and die cuts!! Can’t wait for the release!!! Love the thread cards die. I love what you did with the roses from Sweet Life and your Thread cards on the Linen Vellum Cardstock. Good grief! How awesoem it all is! I collect vintage sewing supplies, and I absolutely adore everything previewed today!!! If I had to pick a favorite, I’d have to say the thread cards – both stamps and dies. I can’t wait to see the full reveal! Thanks for all the wonderful designs and samples. 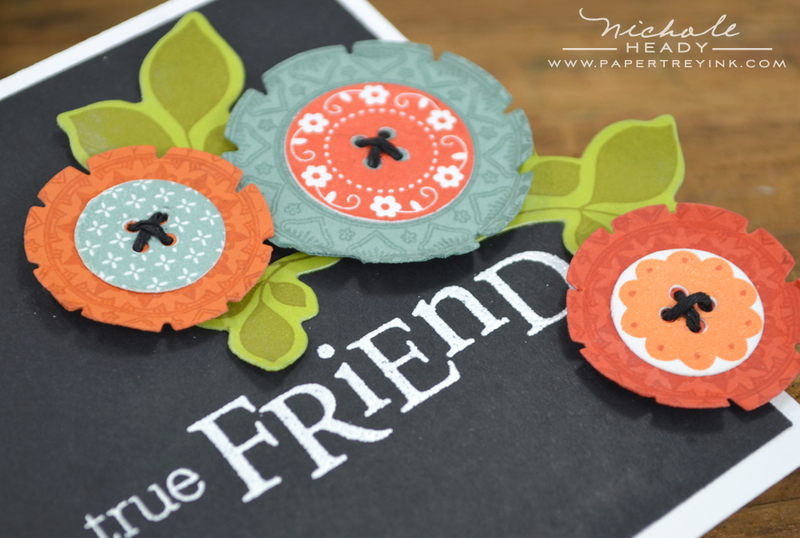 I love the circle cover die and the card made with it. I have the hexagon and harlequin cover plate dies and think I need to add this one to my collection. i love the possibilites of the buttoned up & sew simple border sets! i think today’s products would thrill anyone with a sewing machine! Love the cards using the Stitches & Swirls and Sweet Life stamp sets – gorgeous! LOVE the new dies as thread cards how creative and practical!!! Thank you! Loving the card samples and the thread card!! PTI always comes up with the best stuff! Can’t wait to get my hands on it! There are sooooo many possibilities! What great projects you have showcased today! And 2 more days to come! The emphasis on sewing is so sweet, I love all of your examples. Homespun and cozy! Your “Craft Worthy” card today is perfectly SWOON WORTHY! Gorgeous projects – love the tactile, homespun but elegant twist you’ve incorporated! What beautiful projects! I really love the sewing theme. Sew-Fabulous!!! I love the thread cards and the button stamps!! I actually swooned when I saw the card with the thread card and pink roses. (And I seldom swoon!). Lovely!! Oh my, these sets are just too sweet! Makes me want to get out all my embroidery supplies and get organized! The products are all amazing! I love the button die #1 and am super excited about the new stamp set for it. LOVE that card with the Sweet Life set. It’s so pretty, soft and elegant. 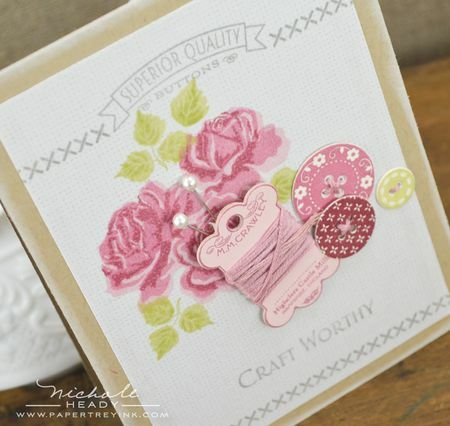 Oh, I absolutely love the card that you made with the thread card and the Sweet Life roses. Every little element comes together perfectly on that card. Thanks for the inspiration. I can’t wait for release day! Your samples today are just beautiful. I really am looking forward to the stiching theme stamps this month, they’re so hard to find! I love all the stitching elements! Once upon a time I would do quite a bit of hand stitching and cross stitch for special projects. I’ve always loved the look and these stamps would really make it so easy and may even inspire me to do some again! I love these Think Big favourites! They make the sentiment stand out in a project! Those thread cards are adorable! And love the think bigs as well. Buttons, buttons, buttons. Very beautiful cards and such a great inspiration. Wow, such cute projects today! I love how interchangeable the button stamps are! How cute are those thread cards. Looking forward to the release. All the projects so far have been fabulous. What wonderful samples for us to drool over. I am always inspired by Papertrey products. I’m so loving all the stitchery related stamps and dies! I want them all! Being a fabric-addict in additiion to a paper-lover, those fabricy stamps and dies are right up my line. The only prolem will be to decide, which ones to order! The circle background looks great, so do the threadcards and buttonstamps. wow – love all the sample cards, especially the ones with the new thread dies. i was trying to convince myself that i didn’t need them… so much for that! I love sewing themes and can’t wait to see the full reveal! what beautiful cards! I everything about them! The thread cards are a great idea! It will be nice to cut my own – and I like the different designs, too. Fun ideas, the way they’re used on cards! I love the big sentiments! Love the circles cover plate! Love the thread cards and the buttons too! This release is looking so fabulous! So many things that are just perfect for winter crafting! My skills with a needle are pretty much limited to cross stitch and buttons, so this is a perfect collection for me! Love hanging by a thread. Love all of today’s products! Can’t wait to get the thread cards die. As always, you don’t disappoint. Love the cards today and can’t wait to purchase the new circle cover plate. Thanks for sharing. So glad to be back from Hurricane Sandy (I was without power until yesterday and I still have no phone or internet.) It was the first PTI release I was missing since your very first release. I came back to a great preview. I love the thread cards. A fabulous companion to my Button Card set and dies. Love all the sewing-themed products this month. love the sewing theme for these stamps and dies! i have lots of friends who are quilters, sewers and cross-stitchers so i’ll be able to make them some great birthday cards this year! Wonderful projects and new sets! Thank you for the inspiration! I’m loving the stitching theme this month. Love the floss cards, need to redo my cross stitch thread badly. Can’t wait to see the knitting stuff though. I love how sewing has come on so strong into the scrapbooking/cardmaking scene. Buttons are my favorite accent, and the thread cards are so clever! Love it when you make big versions of the sentiments. Love those buttons! Definitely adding them to my order! I’m really loving that circle plate! The samples today are wonderful, and the new mini-stitching set is a must have! The Hanging By a Thread and Sew Simple sets are a must-have-perfect for all my stitching friends! Love the circle card with the stamped buttons, great mix of cute and clean design. I can’t wait to order the thread cards. Just adorable. Thanks for the beautiful inspiration, Nicole. Love the thread cards AND the THINK BIG Favs! Wahoo!!! Keep the fun coming! Love the vintage feel of these new stamps, dies and backgrounds. Nichole, your card samples are always so inspiring. Ok every one of your design team members are inspiring also. What cozy, comforting images! Love. Love the new Button Up set! Love all the new sets! Especially when combined with Stitches and Swirls and Sweet Life. I’m so excited about the floss card dies. They’ve been on my wish list for years! Love your samples and what you are doing with the dot/circle cover plate!…Awesome! This wants me to break out the floss!! cute! Great sewing dies, and the Think Big additions is a something I’m definitely adding to my list of must-haves. Tks for a great release so far, its just the beginning! I love the idea to use the stamp set and dies to organize my embroidery floss! And the Button Up is so cute! Fun as always, such inspiration. The thread cards will be great for many projects. Really wonderful projects, Nichole, and fun new dies! Swoon – Love the Hanging by a Thread set and thread cards. Such a perfect accompaniment to Melissa’s Button Up set. Both of these will go perfect with existing PTI sets too. Keep the Think Big Sentiments coming. Love them! What a wonderful release! You have a way of making everything a “must have”! Love Love Love those buttons! Great cards! Great cards and I have to have all these new stamps and dies. I am amazed at how real those die cut embroidery floss cards look! Love the thread theme. What a great idea as well as practical. I like the sewing cards! Great release. I adore the vintage feeling of the thread cards and I can see them being used in so many ways from storage to decor to gifts to scrapbooks and cards. I always love the versatility of Papertrey Ink!! I love the thread card dies! Can’t wait to see more! Great releases! And loving the inspirations. 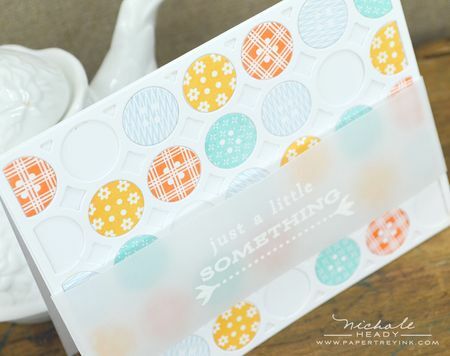 I love what you’ve been doing with the new circles coverplate, Nichole! And your pairing of those gorgeous roses with the floss image is so pretty! Your cards are all amazing! I would love to get all of the new products! Oh yeah – the Thread Cards set is calling my name. It beckons me. Can you hear it? Love any kind of stamp and die to do with sewing…these are awesome…going on my want/need list for sure…..!! What wonderful products! I love the circle plate die and those buttons are adorable! Can’t wait to see more!! What a lovely collection of cards you’ve shown us today Nichole! I also love how you’ve shown us how to use elements from older stamp sets (like the ruler image). Keep up the great work! love how button up match with the new circle die. These are just fantastic I can’t wait till the release. I haven’t embroidered in years! BUT, this is the perfect time to get my supplies back out! Thanks so much! I love those little thread cards. I have some bakers twine that so need a cute place to be stored. it will be fun to stamp the thread card with ink to match the twine color. Love all of these wonderful products! Gonna break the budget this month! Love all of the new releases this month! I have a lot of sewing friends and family I create for-the button dies are great! Incredible!! I am loving today’s projects!! There’s so much to love today…the thread cards are fabulous…the Aida impression plate is a must have…I was a cross stitcher before I became a card maker, so I especially love the stitching theme this month. Loving these new products. And I still can’t get enough of this new cover plate. Love the sew simple borders! i love the think big favorites! The roses card is simply gorgeous!!! How do you consistently come up with these amazing projects?? I love what I have seen with the new cover plate. So fun. OH ME OH MY, cute stuff ! Love the Thread Cards and those buttons are perfect for flat mailing. Love the homey feel of the buttons and thread spools. Looks like another great release. I think this cover plate is my favorite of that line. Great projects! Fun ideas! Can’t wait until the 15th. I love all the new products and can’t wait for them to be released! The Craft Worthy card is just gorgeous. I love the colors and all of the elements you have chosen. I also love the new Think Big Favorites. Such fun ideas with the new sewing stamps! Love the circle cover plate. As always, love it all. What amazing projects! 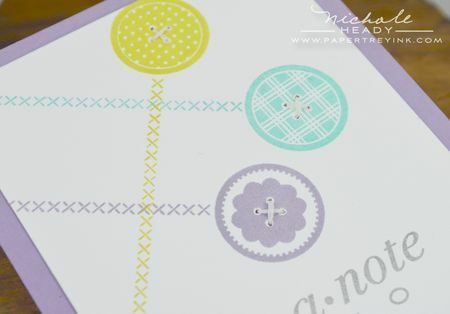 I love the card made with the circles die! The thread cards are such a neat idea! The 15th can’t get here soon enough! The thread cards and Button Up are right up my sewer/quilter/crafty alley. Definitely on my have-to-have it list! I have many friends who sew and would enjoy the ideas in these cards. 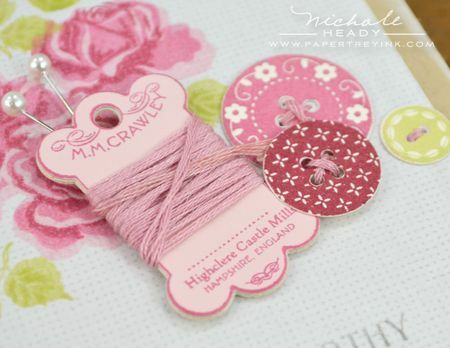 The vintage floss cards and dies are so sweet! I love the new thread cards. What a wonderful way to wind ones ribbon and make it look so stylish. Thank you for all the wonderful inspiration too. These new sets are my absolute favorites! They are so versatile…I think these are a must have for me!! Wow! What a great duo with the sewing stamp/dies! Love all your projects! I am in love with all of today’s peeks. The thread cards, the button and stitches stamps and the Aida cloth IP = serious LOVE! Love the new buttons! Can have the “look” without the real button! Awesome! So cute! What fun ideas! Wow – I just love all the new stitching/sewing items – fun, fun! Love the button stamps and the sewing borders. Beautiful samples today. Really love the projects! The “True Friend” card is my favorite! I love the cards you have done. The new theme is wonderful. Can’t wait until Christmas! Lovely cards and I’m so looking forward to this release. Oh how fun! Love it all! I’ve recently started watching Downton Abbey, so these new sets are certainly calling out to me. Great projects! I love the new products & the creative projects provided so much inspiration! Well done! PTI never fails to wow me! Love your projects today! How beautiful and creative! I knew that the new Cover Plate: Circles die and the Button Up set would be perfect together!! Now, I can’t wait to see it paired up with Melissa’s new button stamp set!!!! Love the buttons and the thread cards. So much fun stuff in this release. Love the thread cards, and the card samples are fabulous. Beautiful projects – love the thread card die – so many possibilities! I am loving the sewing themed items, especially the vintage thread cards!! I love all the projects you talented ladies created, also! Oh, I absolutely love the little thread spools. I cannot wait to get inky with those! I love the new thread cards. My Nanny embroidered all the time. I have her tin and her flosses. I don’t have the time or the patience to do it now @ 49, but I would enjoy stamping it. LOL What a fun addition for sewing themed cards and projects. The thread cards are so cute! What a great compliment to my button cards! Love, Love, Love! You all have done it again. Well done. Love everything from today’s post…awesome projects! I love to cross stitch and today’s release is a must have! Love all of the samples today! Too cute, love that True Friend Card! Thanks for the chance to win! Buttons, really? That’s what I thought at first…but then I see them stamped…and I rethink…hmmm… I really like those!! The circles cover plate is great! I can think of so many possibilities with it! I love the combination of the circles coverplate and the buttons! The card came out so bright and fun. I can’t wait to get my hands on one! Another batch of wonderful stamps and dies! Thread cards are so cute. I can’t wait to get my hands on the circle cover plate. I think that will be my favorite one yet! Another great release from PTI! Love the peeks of the new thread set! Fabulous! The button & button card dies and stamps are my very favorites from past releases and these are AMAZING additions! So beautiful! The Thread Cards are great! I would love to have all my embroidery threads on these! Oh, I love that button set!! It is adorable! Your cards are wonderful as usual! I am VERY excited about Hanging by a Thread! I can’t wait to make custom floss holders. Beautiful cards today! Getting excited for full reveal–can’t wait to see the entire sets. …..Button Up and Sew Simple Borders are going to be at the top of my list….they will both be fun sets to play with! Love them all! That red and cream combo is lovely! My mom is really into needlework and loves making homemade cards. I would love to get her some of this new collection! these are great! Can’t wait for the release. This is my favorite sneak peek so far! Love the roses card and the cream and red card is gorgeous. So many awesome samples! I’m sunk over the thread card dies-I love them! Glad to see the button set, and it looks great with the circles coverplate. Thanks for the chance to win! Love the new Button Up set. Super cute. Love the first and last cards. My favorite item from today’s post is the Sew Simple Borders stamp set. I can’t believe that it’s only $5! Thank you for such a reasonable price point. Wow! Are those buttons cute! They loo fab with the notched flower! I am so in love with your rose card!!! What a perfect match. LOVE this release! Another great preview! So looming forward to playing with some new PTI goodies! I love the new buttons!!! They are so cute! 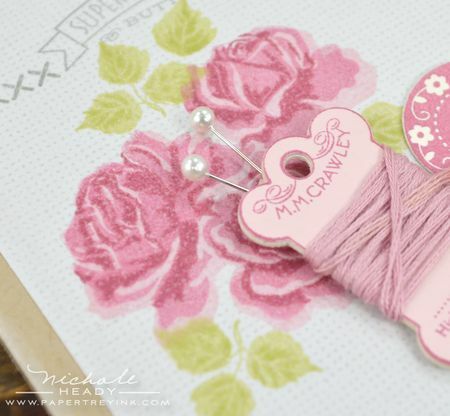 Those little embroidery floss dies are super cute, too. Way too many cute things this month! Hooked on the Think Big Favorites! Loved everything! 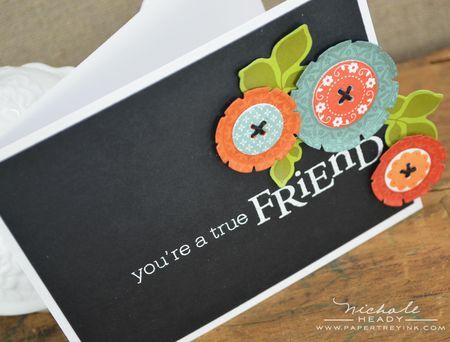 but especially the flowers on the you’re a true friend card! I am really liking the buttons and the sew simple borders! I’m really looking forward to having the dies for the thread and floss. I love the buttons too. Great ideas! Buttons and button cards are so cute. Love that they work with the button dies from prior release. And so cute that the buttons can fill holes of circular background die. Loving this new release especially the button designs! Can’t wait for the release! I love the opportunities the Papertrey team provides to combine various crafty techniques into a single project, this time embroidery. Very clever! BUTTONS are what brought me to PTI to begin with…I just love this new addition. The thread cards….too die for! The thread cards are so pretty and the Think Big set is a must have set in any collection. A great release so far Nichole….keep it coming. It is always a treat to see the new products. I particularly like the button cover plate. Mmm…looks like a great release. I’ll be adding to my Think Big collection, and the sewing theme dies are too cute! Thank you! Love the cute little spool die and the cross stitched sentiment…. The thread cards are charming, especially with their nod to literary characters. The vignette you created with the thread card and roses is sure to push any fence straddlers into the buy side. The thread cards are such a sweet decorative touch, and I love the versatility of the buttons (notched button flowers were gorgeous!). My wife will love these. So nice to see something from one crafter to another – lovely. Love those thread card dies!! Love the Thread Cards & Stitched Borders!! Just darling! LOVE the projects! What a fun line of new products this month!! I too love the colors red and cream together. Your card reminds me of my Gramma! This is “sew” amazing! I just love your samples… The new dies are going to be sew much fun to use! Wow, what a release! I’m super excited. I love the sewing theme, way to go! Another great day of samples. I thought this would be s light month, boy was I wrong! Great inspiration today. I am loving the Think Big release. love those button flowers ! and their colors too ! THREAD CARDS! I must have those! SO cute!!! want to add them to the JAR!!! Wow, the ability to easily make my own floss cards- how delightful! Lots of great possibilities with these new products! I can’t wait to see all of the knitting stamps. I already know what I want to do with them! Love the thread cards, I’m always amazing by your creations! Not sure what I love best as it’s all so beautiful! Oh my that sweater is the cutest thing!!! This art is very nice and very useful..Thanks for great art..keep it up..